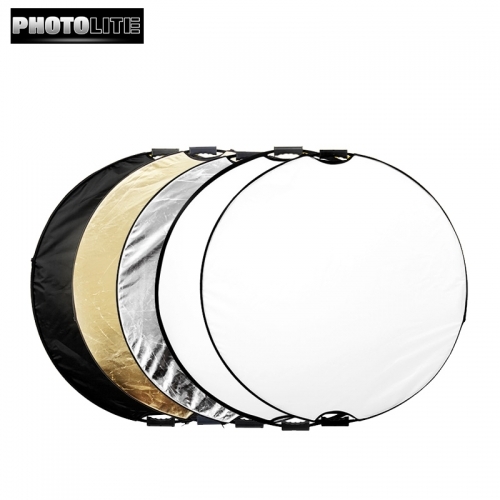 This is a Photolite 5-in-1 Light Multi Collapsible Reflector 110cm (44"). It includes 5 colors: Gold, Silver, White, Black, Translucent. Can be used both in your studio or outdoor. Ideal for taking portraits, still life, close-ups, nature (hills etc.) and also product photography etc. Can be used with all light sources including daylight, tungsten and flash etc. Ideal for digital and film photography as well as video applications. This reflector helps complete lighting control in a really neat and simple way. Portable and easy for storage with the carrying case.